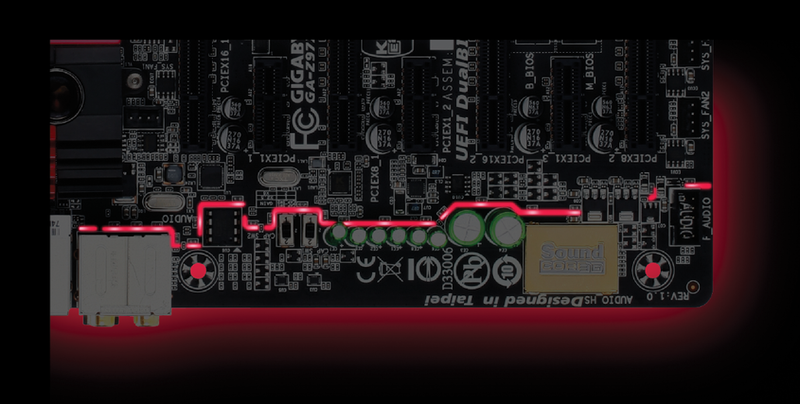 GIGABYTE G1™ Gaming motherboards are equipped with the GIGABYTE exclusive AMP-UP Audio Technology, which provides the industry's highest level of onboard audio features and technologies. With GIGABYTE AMP-UP Audio, gamers and audiophiles are able to experience crisp, ultra realistic sound effects while gaming, and the richest possible sound experience when listening to their favorite music and movies. Shortest route, no wasted trace. Less crosstalk & less EMI. AMP positioned close to audio jack for lowest noise. Better signal quality and better audio quality. The shortest route is always the best for audio signals. The GIGABYTE 9 Series G1™ Gaming motherboards feature the shortest audio communication paths between each critical component, from chipset to audio jack. This reduces the crosstalk along the way, and the very close proximity of the AMP to the audio jack directly results in lower noise disturbance. With this high quality audio design, GIGABYTE G1™ Gaming motherboards are able to bring users better signal quality for the absolute best audio experience. Users can choose audio quality based on individual listening preferences. Wide availability of additional OP-AMPs. Improve audio dynamics and overall sound-quality with little cost. No need for expensive speakers or high-end audio equipment. Select either standard 2.5x or high-amplification 6x mode. 6x mode is ideal for high impedance speakers and headphones. LED trace path lighting illuminates to show the separation of the PCB layers. GIGABYTE G1™ Gaming motherboards feature the Killer™ E2200 from Qualcomm Atheros, a high-performance, adaptive gigabit Ethernet controller that offers better online gaming and online media performance compared to standard solutions. Flexible graphics capabilities supported for either CrossFire™ or SLI™ action, delivering the ultimate in graphics performance for gaming enthusiasts who demand the highest frame rates without compromising on resolution. GIGABYTE's EasyTune™ is a simple and easy-to-use interface that allows users to fine-tune their system settings or adjust system and memory clocks and voltages in a Windows environment. GIGABYTE Cloud Station™ is composed of several GIGABYTE's unique apps that allow your smart phones/tablet device to communicate, share resources, and control desktop PCs via wireless connection. More links for "Z97X-Gaming 3 Intel Z97 (Socket 1150) DDR3 ATX Motherboard"